Latte here is a spicy little cup-of-joe. She’s technically a senior dog but you would never know it based on her activity level and her energy. 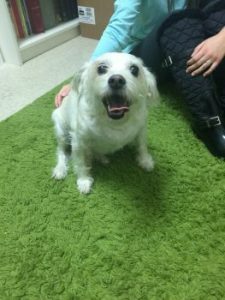 Latte has luxating patella in both of her back legs and she had started to have a lot of trouble with stairs, jumping on furniture, and even going on walks. She was limping and even a little lethargic, and would occasionally cry out in pain. Without knowing what exactly to do to help, her fur family decided to give chiropractic a try. Latte was slow to get up and unsteady when she moved at her first visit. She hesitated to get into a sit and was struggling to stand from a down position. Her muscles in her hind legs had experienced significant atrophy during the years of having her patellas luxate. Though one side was more severe, they both needed a lot of work to get them up to snuff! Latte was not the happiest of campers getting adjusted because she was in a lot of discomfort…but all that soon changed. Latte now walks in with purpose and excitement. She doesn’t limp, her muscle tone has equalized and strengthened, and the girl can get up and down without trouble at all. She’s basically become a jumping bean and we cannot get over the progress she has made. Between good parenting and a mobile back end, little Latte certainly doesn’t need her morning cup of coffee anymore! Vitamin D and Your Pets!